What I am about to tell you is quite simple yet extraordinary in its power to make your life better. You probably have heard the saying, “You are not your thoughts,” but maybe you are wondering what that means exactly. You might KNOW that you are not your thoughts in your brain, but do you KNOW it in your body and soul? Can you embody this idea? Thoughts come and go. You are the observer of these thoughts. You are not the thoughts. You are the observer. The thoughts are like a movie screen that you are watching. You are the projector. The true you can direct and guide your thoughts. I guess that makes you the director too! You are the observer of your thoughts. You direct and guide your thoughts. This means that you do not have to get attached to any thoughts. You can choose thoughts that nurture and empower you. You can guide yourself away from thoughts that steal your joy and disempower you. Thoughts are important. Thoughts guide your feelings, which guide your actions, which determine the results you get in your life. A Course in Miracles says you are not responsible for every thought you have but only those you keep. What thoughts are you keeping? What thoughts would you like to keep? Only when we detach ourselves from our thoughts can we truly guide our thoughts in a way that helps us. So it is time to start observing. Are you choosing thoughts that empower you or disempower you? Hint, if you are feeling bad, you are probably choosing disempowering thoughts. Click below to watch the video or just keep reading! Write down three thoughts that you have that disempower you. Getting them out on paper calls them out and makes you realize that you are choosing them. Say the thoughts over and over until you feel it in your soul. 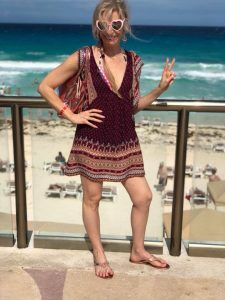 Please email me at elizabeth@yourhighestlight.com or comment below and tell me what your new empowering thoughts are! I can’t wait to hear! Now take three deep breaths with me. Get relaxed as you let the tensions of the day go. Good. Now let a time come to you when you were able to break free of your thoughts, even if it was just for a moment. Two times come to my awareness. One was on the beach with my niece. The other was taking the train through the english countryside from London to Liverpool. Oh and one more was in the ocean on my honeymoon in Puerto Vallarta, with my husband, looking at the mountains. All of these times in my life were spacious. My mind had room to breath. I could forget my troubles. I could think expansively. I actually could stop thinking even if just a few moments. I could let go of the past. My mind was still. And when I did think, I thought of how wonderful everything was and of what I was truly capable. Those empowering thoughts are more truthful. The past is only in your mind and can only hold you back if you allow it to hold you back. What other people think of you, mistakes you have made, mistakes others have made, it’s all in the past. It’s currently all in your head. Allow yourself to forgive yourself and others, and let the past go. Then you can find moments, space in your mind, for new and glorious thoughts. You do not need a trip to England or Mexico. It helps to think of more dramatic times when you mind was free in order to capture the feeling, but it really only takes a moment to free yourself of your thoughts. 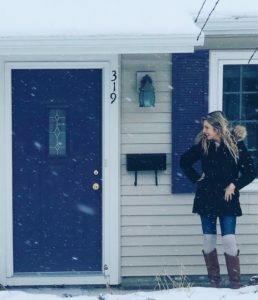 If you can find one moment, looking out the window at the sparkly snow for instance, where you can let go of the past (and it all is in the past), give you mind space to breath, that is all you need. That, my friend, is a miracle. I have a new doTERRA essential oil blend that helps me choose empowering thoughts! 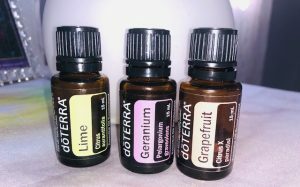 I put four drops of lime, four drops of grapefruit, and two drops of geranium in my diffuser! Lime and grapefruit help uplift your thoughts. Geranium helps relieve feelings of stress (and it smells so good). These are just the mental benefits of these oils. There are many physical benefits too! I find the oils really help to ground my new positive thoughts and intentions. To order, go here..https://www.doterra.com/US/en/site/scentofanangel/become-a-member Also contact me at elizabeth@yourhighestlight.com for more information on the oils and how they can benefit your life! Remember, you are the observer of your thoughts, and from now on you choose thoughts that empower you. Contact me at elizabeth@yourhighestlight.com to set up a free lifecoaching consultation! We will empower your thoughts and lift you up to a more beautiful reality!